Two serums designed to help the appearance of aging skin come in bejeweled pumps and are accompanied by a golden tote bag in this giftable set. I just love this product! Its actually the very first product thats gives results the first time it is used! I have purchased numerous brands with little to no results and spent an absolute fortune that are in the cemetery of products! I unreservedly recommend Prai! The golden bag is a perk too! 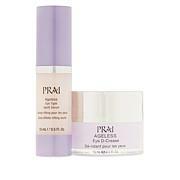 I ordered the prai beauty duo, lift & 24kt gold caviar serum. I've used this product for a few days now & i love the 24kt serum, it's the best product i've ever tried. Not sure about the lift, but will continue using it. 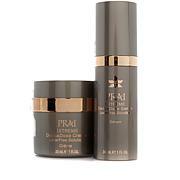 I will not be looking any further than Prai 24kt serum, i've found the best product ( i'm 55 ), for me. Thank you so very much for this wonderful product, i will absolutely recommend this product. I like both of these serums and I'm able to use them both day and night. They work well under makeup. I didn't get instant results but now that I'm halfway through the bottles I can see that they are working. BTW, The bag is ok, but I'd rather these kind of companies just reduce the price by 10 bucks and just forget about the "gift". We all have umpteen bags laying around from these kind of promos. Even with that said, I do like Prai products and I'll keep using them. I love the Holiday Duo by PRAI. I will use the purse during the holidays. A day-to-day tote with luxe leather. These swoon-worthy details make the most out of a favorable item that stashes the goods and makes you look good while doing it.